Just received mine ! I’m very excited !!! Yes indeed. In fact, it’s rather annoying, I press it too often instead of the real MIDI button. Mines is on its way. The missus asked this morning if I was stupid enough to order it yesterday. With that sort of loaded question I had to mumble that I was still thinking about it… Ha ha. Undercover octatrack here i come. Might write an album of tunes written from hiding in the cupboard under the stairs. Congrat for your new device otherwise. Have a lot of fun with it. How do the effects sound on the Mk2? Are they any better or just the same as the Mk1? I’d held off buying the Mk1 because of people saying the effects were ‘weak’. I have the Digitakt and I like the effects on that, especially the reverb. Does the Mk2 reverb compare the that of the Digitakt? The FX sound the same as in mk I IMO. However, they do not sound “weak” to me… they have their sweet spots. Are they any better or just the same as the Mk1? Thanks for the replies. I’ve listened to everything on the internet, seemingly, and will deffo get one of them, either a good condition mark 1 or the revised edition. Question is, do I still really need my Digitakt if I have an OT? I think the OT has everything DT has now, seeing as it’s getting conditional trigs. Tough to answer anything other than “depends”. For most, the OT is the DTs big brother and would replace it comfortably. But the DT does have some things that are more immediate. For me, I’m hoping a few things I learned from the DT around filter use can be applied with the OT. I’m positive it can be. The filter was always something I neglected when I’ve had an OT in the past. Time to change that! I finally bit the bullet and ordered mine, but I won’t be back home to play with it until mid-November What tutorials / manuals should I study in the meantime? I’ve watched all of @cuckoomusic’s videos, but that’s about it. Merlin’s guide is very handy. The recent video from “knobs” is a really good watch too if planning to use the OT in a non “traditional” way (a lot of examples stick to four to the floor techno which, of course, there is nothing wrong with!). 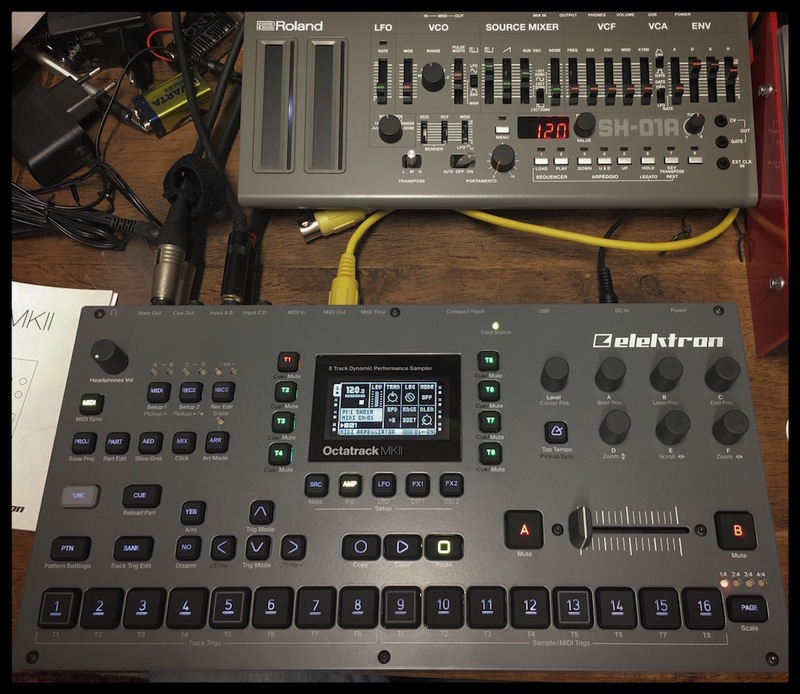 A post was split to a new topic: Machinedrum or Octatrack? Pickup machines blowing my mind right now! Turning some Rytm-only tracks into whole new loop fodder. Never quite got head round pickup machines in the past. I always made stupid mistakes and erased by mistake! Was planning on giving them a go with some drums from Maschine though. Determined to get my head around parts this time too - I have never understood them haha. Even with Merlin’s guide! Time to change that. The new and additional buttons have made pickup machines (among other things) more intuitive for me. With the old buttons you get the primary function (record), and then the additional function (record setup). That’s pretty limited considering what all you can do with those buttons, but you’ve got to spend some time learning (videos… manual diving) and practicing what they can do. With the new buttons, the primary function (Record) is on the button itself. The additional function (record setup) is the first text under the button, and then yet another additional function (previously hidden on the interface) [ record + ; record play/stop ; erase ] is beneath that. More info and doesn’t feel like it is cluttered. No need to go back to the manual because its been some times since you used pickup machines. It just makes sense now, and the visual cues on the interface make it difficult to forget. Same for the tempo button for pickup sync. It took a few days of use to appreciate the reality that the MKII is indeed more intuitive. From the new and additional buttons (I am constantly accessing the audio editor and using track trig edit functions, not bothered by what recording mode I may be in), to the waveform navigation text beneath the encoders, it really doesn’t feel nearly as complex or daunting as the MK1 reputation was. The degree to which the interface is streamlined and the features more accessible seems understated. If you took a stab at the OT MK1 and couldn’t get on with it, you might be surprised how quickly and effectively you may get things done on the MKII. I certainly am. So how cheap can we expect second hand MKI units to go for? I’m finally going to get one to pair with my Rytm. Depends where you are, but in the US… No lower than $750-$850, I would guess. And not until used MK2s hit the market. $800-$900 until then. THIS IS WHAT I WAS HOPING FOR!!! YESS!! !